A delicious addition for outstanding coffee. 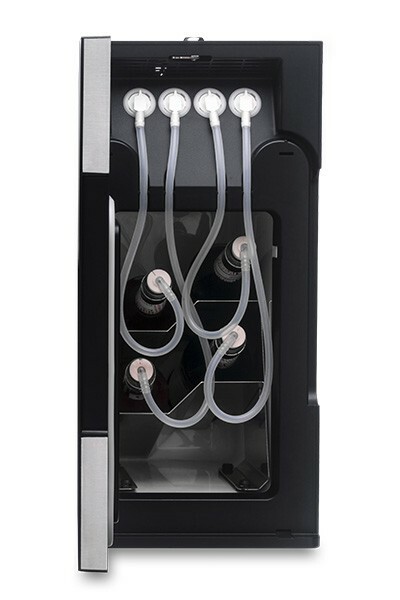 The new WMF Syrup Station adds an exceptional taste experience to any beverage menu. Thanks to direct connection to a compatible WMF coffee machine, the coffee mix specialities created using this feature can be stored as standard drinks on the coffee machine display in just a few simple steps, with over 20 different standard icons available. Let your creativity run wild: with up to four types of syrups, fruit purées or spirits available in three different dispensing quantities, you can create your own individual recipe ideas without any restrictions. Thanks to the new-generation design that is perfectly coordinated with the WMF coffee machines, the Center Cooler and Syrup Station are the perfect pair, giving “coffee hubs” an appealingly stylish look.